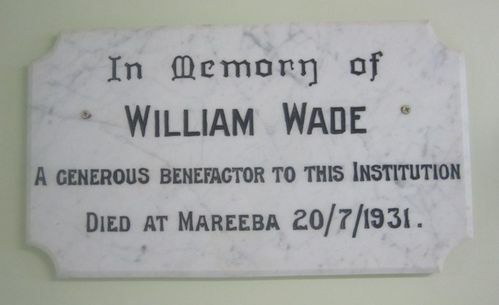 A memorial tablet commemorates William Wade who was a generous benefactor to the Atherton Hospital. ATHERTON, December 16th. To-day at 2.30 p.m., at the Atherton District Memorial Hospital a tablet to the memory of the late William Wade, who so generously left £800 to be used for the building of a modern laundry at the Atherton Hospital, was unveiled by the Chairman of the Tinaroo Shire Council, Mr. W. Whiting, in the presence of a number of citizens. Afterwards the new laundry with its modern labor saving equipment was inspected. Mr. W. L. Matthies, Chairman of the Hospitals Board, introducing Mr. Whiting, said: The late William Wade was a native of Sydney, and passed away at the Mareeba Hospital in 1931. He followed the life of a miner and prospector in the Ord district, where he was well and favorably known. At one period he was a patient in the Atherton Hospital and during that time he made a will in which he left £800 to the Atherton District Hospital for the purpose of building an up-to-date laundry. He also left £800 to the Mareeba Hospital, but did not specify for what purpose the money was to be used. The Atherton Hospitals Board has made use of the money in the manner directed by the late William Wade, but found that in order to have an up-to-date plant and building it was necessary to spend a little more money than was provided in the bequest. Accordingly, we borrowed £280 for that purpose. Cairns Post (Qld), 23 December 1933.